Some questions to ask, before you file that cheap divorce! | Pittsburgh Family Law Services, P.C. Some questions to ask, before you file that cheap divorce! February 22, 2011 · by Pittsburgh Family Law Services, P.C. DO YOUR OWN DIVORCE WITHOUT A LAWYER. READ FREE ARTICLES ABOUT FAMILY LAW IN PENNSYLVANIA. READ THE REVIEWS on Google, Facebook and Avvo. I’m an excellent housekeeper. Every time I get a divorce, I keep the house. If you are like most people, you don’t want to spend any more money for something than you absolutely have to, whether you are fueling your car, repairing your roof or getting divorced. Who wants to make a divorce lawyer richer? After all, you’ve worked out who is getting what, the kids are covered, and all you really need is the piece of paper that says you aren’t married. It’s time to shop around for the lowest price, right? Even the friendliest divorce proceeding is still a lawsuit, in a very literal sense. You will be the Plaintiff, your spouse will be the Defendant, and you are asking a court of law to dissolve your marriage based on one of the grounds identified in Section 3301 of the Pennsylvania Divorce Code. Know what you are getting into. Welcome to the divorce mill. You’ve seen the ads for cheap divorces. Pennsylvania Divorce, just $[something cheap] complete! No-fault divorce, simple and uncontested! It sounds almost like some kind of machine where married people go in one end, and single people come out the other. What could be easier? After all, as long as everyone is entirely in agreement and ready to cooperate, Pennsylvania does not require a divorcing couple to pass through the courthouse door. In fact, many people do succeed in getting divorce decrees from these firms. Many do not, however, and during the course of my career I have been hired by numerous “refugees” to sort out divorces that the mills failed to handle properly. Before you pay the money and step into the machine, it is a good idea to ask a few questions. Am I sure that my spouse will cooperate fully? In my experience, a spouse who promises cooperation usually does cooperate… but not always. Before you hire a family law firm for your divorce based strictly on price rather than by skill and reputation, be very, very sure both of what services you are buying (and what services you are not buying! ), and also that your spouse is on board with everything he or she will have to do to make sure that things go through without any hitches. Don’t just assume, ask and be certain. Am I sure that all I need is a divorce? There are rights arising from marriage that have to be claimed through the court or protected by a written agreement, or they will be lost forever once the divorce becomes final. These rights include spousal support, alimony and court-ordered distribution of property and debt (including pensions and other retirement assets). Divorce is supposed to bring economic closure as well as personal closure, and leaving loose ends can have extremely negative personal and financial consequences. When in doubt, consult a lawyer before taking any other action. Sometimes, an ounce of prevention really is worth a pound of cure. Who will be handling my divorce at the law firm I choose? A lawyer? A paralegal? A secretary? Is the firm you are investigating able to tell you at all? Divorce mills make their money from the huge volume of the cases they handle instead of from individual case files, so they need to handle them as impersonally and efficiently as possible. That sort of business model requires that everything about how the divorce process is handled in-house needs to be thoroughly standardized, and then handed over to the lowest-paid person who can still do the work without spending too much time on any single case file. For all anyone outside the firm can know, the closest an actual lawyer gets to reviewing and overseeing your divorce process could be to sign your divorce documents as part of a stack of forms placed on his desk. Can I talk to a divorce lawyer when I call the firm? For that matter, can you talk to any human being at all? Whoever it is who picks up the telephone when you call looking for someone to handle your divorce may also be the one you talk to when you call with a question about your case. Can this person actually give you real information or at least put you in direct contact with somebody who can, or might you instead be talking to a receptionist whose job is mainly to find out where to send a pre-client information package? What does the fee agreement promise? Always read a fee agreement closely. It will promise some things, and fail to promise others. Is there someone at the firm who will answer your questions about it and explain the firm’s policies? Can you call for a simple status check on your case or ask a quick question to a lawyer, without facing additional charges? Where will my divorce case be filed? This is an especially important one. 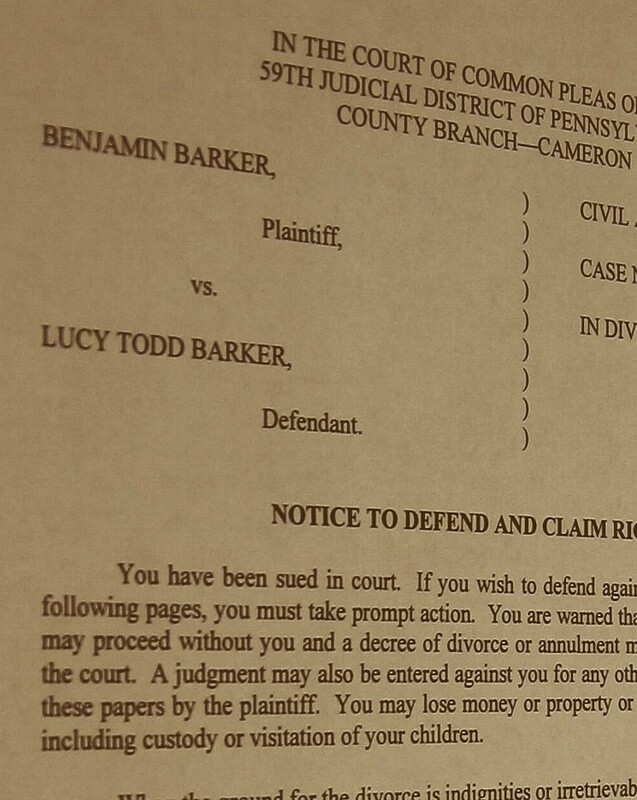 There are two counties in north central Pennsylvania — Cameron County and Potter County — whose court administrators have figured out that the local court system can make extra money by hosting out-of-county divorce cases. Their filing fees for divorces are particularly low, which makes them attractive to divorcing spouses who want to save money compared to what they might have to pay to file their cases closer to home. Filing in these counties is perfectly legal under Pennsylvania law, and the divorce decrees they issue are entirely legitimate; but if your case hits any sort of a snag while it is in process, you are here, while your case is there. Most often the Cameron or Potter County court will drop a case like a hot potato at the first sign of trouble and order it transferred to your home county, leaving you to pay transfer fees at each end that make the case more expensive than if you had filed your divorce papers locally to begin with. If you are sure that your divorce process will be as smooth as silk, with no other issues to address, then the odds favor you being able to file there safely… but shouldn’t it be you who makes that decision? A good lawyer will inform you of all the risks before you take the out-of-county plunge, and leave the final decision to you. Too many people with cases filed away from home have told me, over the years, that the law firms they hired never even told them that their cases would be filed out-of-county, let alone cautioning them about the potential hazards. Be smart… be sure. Will they handle my case as quickly as possible without extra charges? I once read paperwork from a divorce mill that offered “fast,” “faster” and “fastest” divorce service, depending on what the client was willing to pay. Since the court has certain procedural demands including (in many cases) minimum time requirements, it seems to me that the only way a law firm can offer faster processing of your divorce is by eliminating delays that were caused by the firm in the first place! Will I get to review the paperwork before it is filed? Before a Divorce Complaint may be filed in Pennsylvania, the Plaintiff has to sign (and attach) a statement called a “Verification” stating that the facts contained in the Complaint are true and correct to the best of his or her knowledge, subject to criminal penalties for making false statements. Is the lawyer asking you to sign a Verification that the Complaint is true, before you have even read the Complaint? Know for sure whether you will have the opportunity to check the Complaint for accuracy, and supply any necessary corrections, before it is filed. Can you still represent me if a complication develops in my case? If your spouse refuses to cooperate, if economic claims are raised, or if you discover something new that changes the way you want things to go forward, can your law firm still handle the case? Will a lawyer be available to advise you about what to expect or what to do? Can I offer information or ask about my case without extra charges? A divorce mill will tend to discourage telephone contact after you have retained them, even if you are only asking about the status of your case or providing a change of address. Client inquiries interfere with the orderly processing of the high volume of cases needed for the firm to remain profitable. One of the ways a divorce mill can put a barrier between you and the person you need to speak with is by charging you extra money for any telephone contact at all, once you have retained them. Review the fee agreement carefully for “hidden” charges before you sign it and pay the fee. A discount can stop being a discount very quickly, if additional charges start to stack up! Let the buyer beware. As you look around for a law firm to handle your divorce, think about how you would shop for stereo equipment and consider approaching it the same way: think about what you really need, listen to the sales pitch, get a good idea of how your music will play on their system, and keep two important things in mind: first, that cheaper isn’t always better, and second, that a good speaker can make all the difference in the world. How to do your own divorce in Pennsylvania. If both you and your spouse are in full agreement to divorce and there is nothing to take care of but the paperwork to legally dissolve your marriage, consider our $75 do-it-yourself Pennsylvania divorce kit. No frills, no strings, no lawyers. What are retainers, and why do lawyers charge them? If you need legal assistance with your divorce or family law matter in Southwestern Pennsylvania, call me to set up a personal consultation. Please do not comment anonymously, and do not post anything that you consider confidential. We try to be responsive to commentary and questions, but know that posting here will not create an attorney/client relationship and that we will not offer legal advice via the Internet. How Do I Choose the Best Cheap Divorce Lawyer? Consultations may also help you choose the best cheap divorce lawyer. At a consultation, you can gauge how comfortable you feel with a lawyer and note whether he is willing to answer your questions readily. You may also get an idea of whether a lawyer seems more intent on court litigation or settling. You may also ask about his current caseload to assess how much time he will be able to dedicate to your case and learn how much of your caseload he will pass on to his legal assistants. Your suggestions are entirely reasonable, but in this context I offer a caution. Take my words with a grain of salt if you wish, considering the source, but I caution anyone against the idea that a divorce lawyer worth his fee is “cheap” once you find yourself needing anything more than the piece of paper that says you’re not married anymore. Figure it this way: if a lawyer’s pricing falls below “competitive” and all the way into “cheap,” you ought to ask yourself why he doesn’t think he can get more for his services. After all, who goes to law school to be poor? In light of the decision overturning PA’s mini-DOMA in Whitewood vs Wolf, May 20, 2014, is it now possible for a PA resident to file for and receive a divorce/dissolution/or annulment of a NJ Civil Union? What an interesting question! I don’t know for certain, and I have my doubts that anyone else does, either, at this early date since Pennsylvania joined the ranks of marriage-equality states. It seems certain to me that a legally-married same-gender couple can now divorce in Pennsylvania, no matter where or when the marriage was performed (so long as it was legally recognized at that place and in that time). Whether that extends to a New Jersey civil union may well depend on the degree to which such civil unions resemble or differ from marriage under New Jersey law, and (correspondingly) the degree to which civil union dissolution proceedings in New Jersey resemble divorce proceedings (e.g., whether the same standards apply concerning alimony, property distribution, etc.). All this amounts to educated guesswork, I’m afraid, but it seems to me that if (and only if) the functioning of a New Jersey civil union contract substantially resembles that of a New Jersey marriage contract, I give good odds that the matter can now be addressed in a Pennsylvania family court. If it does not, I like the odds much less. I’m sorry not to be able to give a more definitive response, but in some ways this is as new to me (and every other divorce lawyer in PA) as it is to you. You can file for alimony in a no fault divorce, but unless your spouse agrees to an amount and duration of alimony you would seem very much to be in a contested situation, if you decide to go in that direction. If you are considering an alimony claim, I urge you not to file your divorce out-of-county, and (depending on your situation and goals) it might be contrary to your interest to file for divorce at all at this time; if you are an economically-dependent spouse, there are consequences to filing for divorce that might have a negative strategic impact for you. When your future ability to make ends meet is at stake, there is simply no substitute for informed decision-making. Because of this I urge you to talk to a local divorce lawyer sooner rather than later; in divorce and family law situations, an ounce of prevention really can be worth a pound of cure. My husband filed 17yrs. ago but he stopped paying his attorney. My attorney at the time preserved my rights to alimony also there was a retirement account. Once my husband stopped paying his attorney and would barely pay child support he cashed out the retirement account. It’s been many years but there was a tentative agreement. One month after our son turned 18 I just received divorce papers…in the tentative agreement I believe he was to pay for half of his higher education.Now I received divorce papers it appears to be a quicky divorce document wanting me to sign and that would be that. What would you recommend to your client in this situation? “Tentative agreement” is another way of saying, “there’s no agreement.” It’s like being half-pregnant, or one-quarter dead; it is a thing without meaning, outside of the context of active negotiations. The passing years, and particularly your husband’s liquidation of his retirement fund, may have done significant damage to your case. Now, your husband is trying to wrap up your divorce process. In Pennsylvania, divorce is all about economic closure, meaning that any rights you have as a consequence of being married (such as property and debt division) will be lost if they have neither been protected by a written agreement or claimed and litigated to conclusion by the time a divorce decree is granted. What would I recommend to my client? ACT RIGHT AWAY TO INFORM YOURSELF FULLY. As an experienced Pittsburgh divorce lawyer, I think of myself as dealing in informed clients and protected clients… mainly because they are one and the same. If you’re guessing or assuming, you might as well assume that you’re about to go over Niagara Falls without benefit of the barrel. Don’t guess… KNOW, and know NOW, because you might be facing a deadline. A good divorce lawyer can go through your situation, your goals, the law, the divorce paperwork, etc. and lay out your options and your risks. PITTSBURGH FAMILY LAW SERVICES, P.C. Enter your email address to subscribe, and receive notifications of new PA family law articles by email. Attorney Tara L. Hutchinson is a family and divorce lawyer located in the east end of Pittsburgh, Pennsylvania, and serves clients throughout Southwestern Pennsylvania and the Pittsburgh area including the neighborhoods of Squirrel Hill, Shadyside, Monroeville, McKeesport, Edgewood, Penn Hills, Bethel Park, Mount Lebanon, Canonsburg, New Kensington, Greensburg, Murrysville, Turtle Creek, Swissvale, Churchill, Oakmont, Fox Chapel, and Sewickley.